Caption slip reads: "Photographer: Brunk. Date: 1957-12-13. Reporter: MacMillin. Assignment: USC students cheer bolt from PCC. 31/32: Gang of USC kids with bongo and conga drums march down Orchard avenue at 28th street cheering SC's dropping out of Pacific Coast Conference. 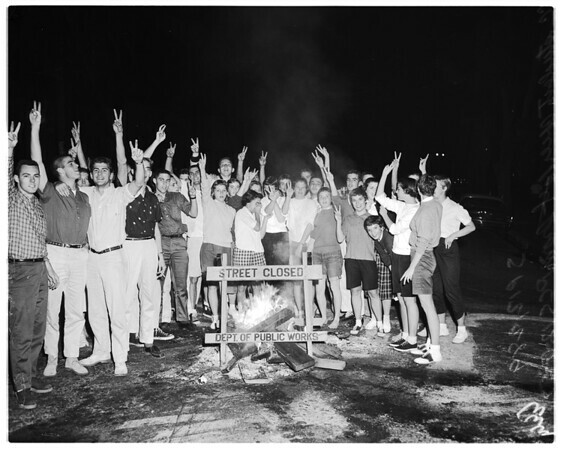 33/34: Another group of SC students assemble at bonfire at 28th street and University avenue to sing SC fight song and cheer against PCC".